If you follow me on Instagram, you may have fallen victim to the large amount of spam which documented every sumptious step of my food journey during my recent visit to Lisbon, Portugal. I can’t even express through words just how much of a divine city Lisbon is. Food aside (although that is what brought me the most wonderous joy on my travels), the culture, the buildings and the people – it was like nothing I had ever experienced before. To wander so aimlessly, taking in every intricate tile, every impossibly purple-flowered blossom, it was nothing short that pure pleasure – of which I simply can’t wait to share with you. I write this whilst listening to the Gypsy Kings – desperately clinging to the holiday feels, my face ever so slightly more freckled and my booty all the more rounder thanks to the heavily-inclined streets and gallons of daily gelato consumed. Gelato is ice cream’s thicker, silkier and sexier sibling. Churned slower than ice cream to enhance both classic and creative flavours, gelato even contains a lower fat percentage as a result – which means you can eat twice as much right? A famous chain with Gelato stores everywhere from Milan, to London and oh, Lisbon! This was surprisingly my least favourite of discoveries – but worth a visit for the novelty nonetheless. Choose your flavours coned, or cupped; as this was my second gelato of the day (ahem…hour), I opted for a cup – but choose a cone to watch the Gelato-ers (new word I just made up), turn your flavours into a petalled flower – ready for your delcious destruction. Santini’s seemed to be somewhat of an institution in Lisbon with it’s signature candy-striped popping up regularly to remind me it was gelat-o-clock. The portions were modest (compared with my later discoveries), but lip-lickingly satisfying. The coconut flavour especially gave me all kinds of good-feels and is best enjoyed in the sunshine, strolling down the local winding roads. I walked passed this Gelato joint daily, each time more full up on delicious treats than the day previous – this cycle went on repeat until my final evening where I gave myself a stern talking to and simply found room following a large Portugese feast to celebrate the end of my holiday. Cheap as chips without compromising on size or delight, the flavours are sensational – choose your favourites and make sure one of them includes the caramel cheesecake. Oh and you’ll get asked if you’d like a scoop of whipped cream on top – always say yes; there’s no point in being modest now! Enjoy at twilight and worry about attempting the uphill journey back to your Air BnB later. 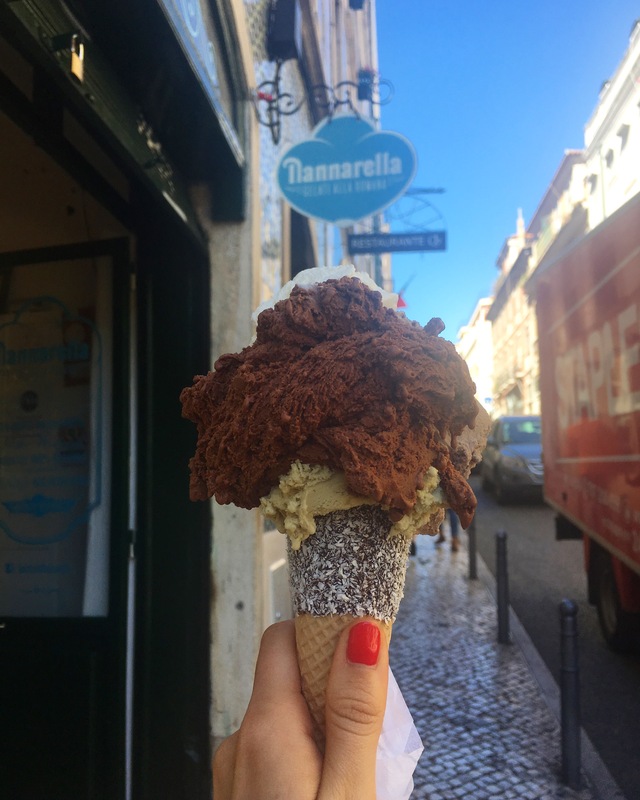 Should you be lucky enough to find yourself in the city of Lisbon, you simply MUST visit Gelataria Nannarella for one of their mountainous creations if it’s one of the only things you do. Locals and tourists flock to this Gelataria for its impeccably good value, sumptious flavours and inability to execute portion control. In short, a divine heaven on a well-crafted cone, which also casts some rather impressive shade on a hot summers day (evidence below). I’d advise walking there to really build up your appetite, and absolutely go Grande; with an astonishing €3.50 price tag, I challenge you to find a cheaper and more delicious way to dance with diabetes. The Oreo flavour was a definite highlight with handsome chunks of Oreo cookie made even more devilishly naughty thanks to the heavy scoop of Cioccolato by its side. Sidenote: A word of caution, the word “gelato” is dangerously close to the Portugese word for gallery; “galeria” for my liking – fortunately I only made this mistake on two occasions and was able to swiftly exit before accidentally buying a “one-off” from Portugal’s rising artists. Picking up a Gelato-to-go-go was my favourite ways of keeping cool in the wonderful beaming Lisbon sun. Each one of these parlours had been seemingly placed strategically only moments away from a picturesque view, so grab yourself a scoop, a stoop and stay tuned for the next in this series of food adventures! **(The only Portugese word I mastered and filled every conversation with). Ugh spam. Don’t like it. I don’t remember any of these places. I missed out big time.